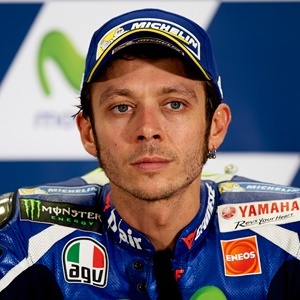 Milan - Italian motorcycling ace Valentino Rossi has revealed he is afraid to stop racing and intends to turn to cars when his career on two wheels ends. The 38-year-old nine-time world champion - who is driving a Ford Fiesta in Milan this weekend as he bids for a record sixth win at the Monza Rally Show - said his dream was to race the 24 Hours of Le Mans endurance race in France. "I'm afraid of stopping. After the end of my career in MotoGP, I will have another ten years in the automobile sport," Rossi told Italy's Radio Deejay on Friday. "I'll keep going as long as I'm competitive and feel like it, of course I'm a bit scared of normal life," continued Rossi, adding he has no time for a family. "I'm still single, I'm always on the road, and it's difficult to have a steady relationship, so let's say I am happily married to my motorbike, which reciprocates my love, if not always." Rossi's bid for a tenth world title was scuppered this year after he suffered a double tibia and fibula fracture in September although he still returned to competition after just three weeks. However, he was also not satisfied with the performance of his Yamaha, with Spaniard Marc Marquez of Honda defending his world title. "We had a good chance of winning the title last year, we were worse this year," said Rossi. "We're hoping for the new year, I need to be in shape and have a competitive bike, and we'll have to make a leap in quality by February." The 2018 season gets underway with the Grand Prix of Qatar on March 18.